A retired schoolteacher—and yes, daughter of an F. Scott Fitzgerald fan—Daisy Buchanan has finally found her calling in the quaint village of Millbury, Pennsylvania. 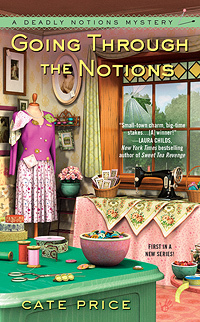 While her husband Joe endlessly renovates their old house, Daisy happily presides over Sometimes a Great Notion, a quirky shop nearby that sells sewing bits and bobs, antiques, and jewelry. Daisy has her eye on an antique dollhouse and a classic Singer featherweight at the local auction—until her beloved friend and mentor, auctioneer Angus Backstead, is led away in handcuffs. It appears he bashed in the head of a drinking buddy who stole a set of fancy fountain pens. Daisy's sure the sprightly old-timer couldn't have committed such a brutal act. But she soon learns Angus had more than a few enemies ... including the detective on the case with a long-held grudge. As Daisy pursues the truth, she also uncovers some promising leads: a disgruntled heiress hunting for the missing pens; two local farm boys with a grudge against the deceased and the accused; and a twisted estate scam that entangled the dead man. But if Daisy can't stitch together the bidder truth—and soon—Angus will be going once, going twice... gone forever. "A fun fast-paced debut filled with eccentric characters, quirky humor, and small-town drama." "Going Through The Notions has everything I read cozy mysteries for—a terrific setting, a smart plot, and well-rounded, clever characters. Lucky us—it's the first in an all-new series—and I can't wait for the next one! Cate Price is a natural-born storyteller." "Small town charm—big time stakes. Cate Price has penned a winner!" "All lovers of true cozies can rest easy now because a new true cozy author has joined the ranks. If you are a fan of Cleo Coyle's Coffee House Series or Ellery Adams' Books By the Bay Series or Susan Wittig Albert's China Bayles series or... well you get my drift, you are going to love Cate Price's Deadly Notions series." "Price is a born storyteller, who uses humor and quirky characters to create a world readers will want to return to again and again. Going Through the Notions is a cozy that has some very thrilling moments and Price is able to draw in the reader with a clever heroine and lots of small town charm." "The author did a good job in keeping me on my toes by throwing me off my track with a couple of red herrings here and there, and overall a good job in delivering a finely tuned piece of work. With a great supporting cast, engaging dialogue and a small town atmosphere, I can't wait to dive into the next book in this pleasantly appealing series." "Going Through the Notions by Cate Price is what cozy mysteries are all about! Even when I wasn't reading it, I was thinking about reading it and thinking about the characters. The story was just delightful. There was small-town charm, a satisfying whodunit, and a wonderful sleuth in Daisy Buchanan. I really didn't want the book to end. I'm anxiously awaiting book #2 in the series, A Dollhouse to Die For."